Access to this highly sensitive area is closely monitored and guidelines are strictly enforced. During peak season this area is managed jointly by BC Parks and the Kitasoo/Xai’xais Guardians. May 15-October 15 – ONLY WITH A DESIGNATED GUIDE. When you arrive in Láiq, please contact the Kitasoo/Xai’xais Guardians on Marine Channel 6. As listed below, there are very specific rules and regulations for this area. Although all estuary systems within the Fiordland Conservancy are sensitive and important ecosystems, Mussel Inlet (Láiq) is an especially significant system for bears and other wildlife. The Mussel River and Poison Cove areas (Láiq) offer some of the most valuable habitat for bears and wildlife on the Central Coast. During the fall season bears feed almost exclusively on salmon. The amount of salmon a bear eats relates directly to its chance of survival during the winter. Check in with Kitasoo/Xai’xais Guardians (vhf channel 6). All visitors not on a tour with a permitted operator need to receive an orientation prior to bear viewing and be guided by a Kitasoo/Xai’xais Guardian or Spirit Bear Lodge staff. No viewing or boat access upstream of the lower Mussel River island [map] or upstream of the tidal flats in Poison Cove creek [map]. Maximum 14 people in total. Stay at least 30 M (~100 ft) away from bears. Check in with Kitasoo/Xai’xais Guardians. No land access within the Láiq Special Management area other than designated viewing site, interpretive rub tree, and designated dog walking area [map]. These areas are off limits to viewing, hiking or any other form of access. Bear spray required by at least one person who is trained in its use. Pets permitted ONLY in the designated dog walking area [map]. Please do not take food onto land. BC Parks and the Kitasoo/Xai’xais respectfully request a voluntary restriction on low-level aircraft access in the Láiq (Mussel Inlet) Special Management Area. This area offers high value critical habitat for bear and mountain goat, both of which are particularly sensitive to loud noise. Due to the high narrow valley topography of this area, the impacts from aircraft noise are increased. We request that flights occur at no less than 500m above the surrounding terrain and that this area be avoided by aircraft entirely unless required for emergencies or with previous approval. Please contact Central Coast Area Supervisor at 250-982-2701. 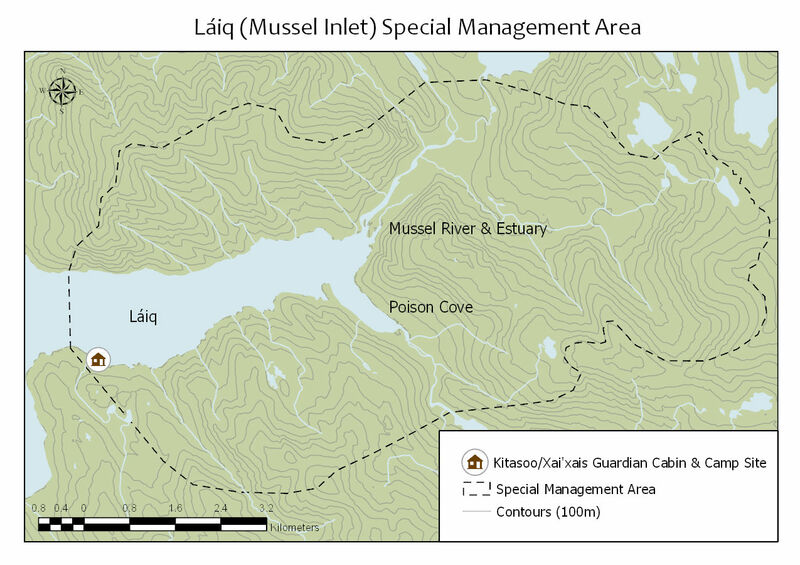 Firearms are restricted below 1000m within the Láiq (Mussel Inlet) Special Management Area [map]. This park is open to hunting. Please refer to the BC Hunting and Trapping Regulations for more information. It is illegal to hunt grizzly bears and spirit bears in Fiordland Conservancy. 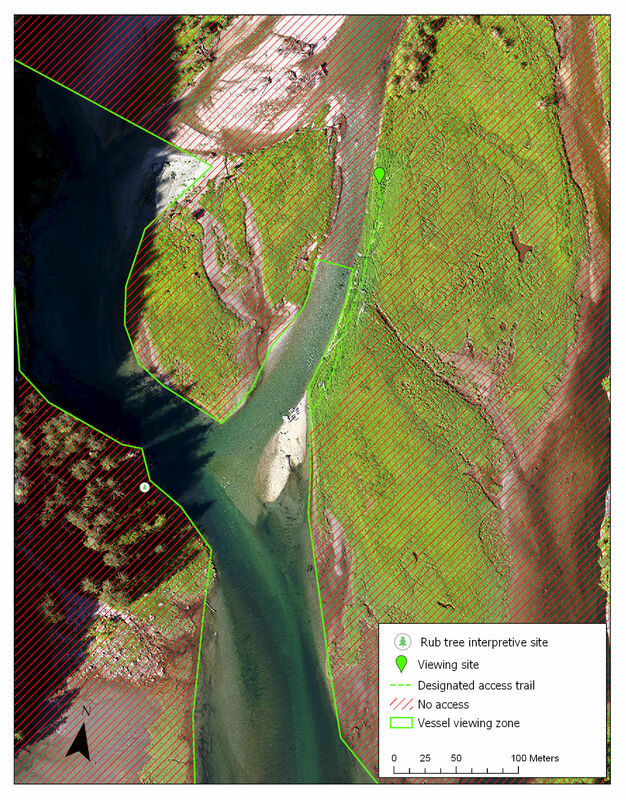 Camping is not permitted in the Láiq (Mussel Inlet) Special Management Area except at the Kitasoo/Xai’xais Guardian Cabin [map]. 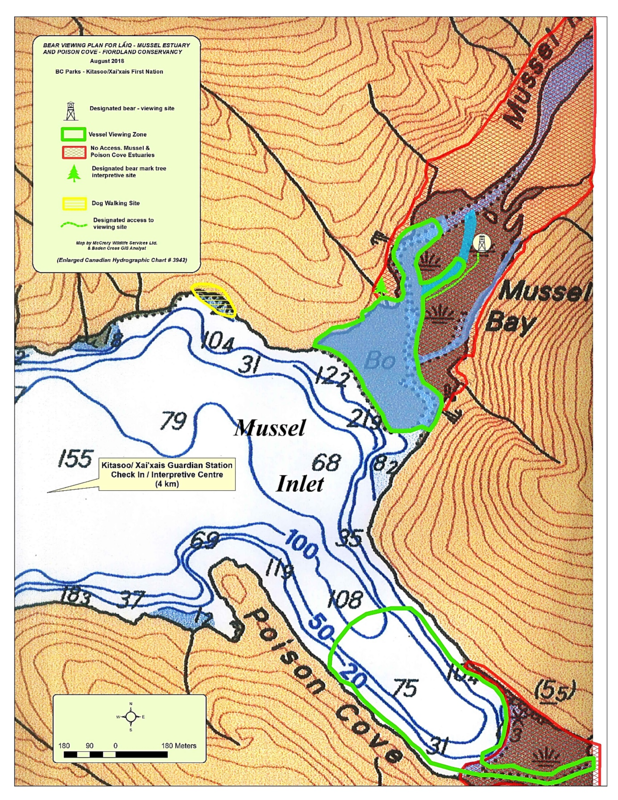 Pets are not permitted on shore in the Láiq (Mussel Inlet) Special Management Area, except in the designated dog walking area [map]. There are opportunities for sea kayaking in this conservancy. Sea kayakers find Fiordland Conservancy well worth visiting; however, there are very few camping sites due to the steep topography of the area. Outflow winds are a major hazard, exacerbated by the scarcity of safe landing spots. Be prepared to spend days on shore waiting for safe conditions. A management plan is being developed for Fiordland Conservancy. For more information and to provide input into the process, click here. The harvest of bivalves is closed due to red tide and the potential for paralytic shellfish poisoning (PSP). Fiordland Conservancy is accessed by water and air only. It encompasses Kynoch and Mussel Inlets, located about 100 km northwest of Bella Coola. It is a popular side trip destination for those cruising the Inside Passage to Alaska. The closest community for purchase of supplies is Klemtu and then Bella Bella. Fiordland Conservancy is made up of 76,825 hectares of upland and 7,592 hectares of foreshore. The area was originally protected as a recreation area in 1987 but was converted to a conservancy in 2006 pursuant to government land use decisions in the Central Coast Land and Resource Management Plan area. Fiordland is the territory of the Kitasoo/Xai’xais First Nations. It is illegal to disturb cultural heritage sites or remove artifacts from them. Please leave any cultural artifacts you find in-situ and report to the Kitasoo/Xai’xais Guardians or Kitasoo/Xai’xais Stewardship Office at 250-839-1096. Fiordland Conservancy was created to protect a spectacular representative of the Northern Fiordlands Landscape. Protecting such landscapes is key to BC Parks’ mandate of representing BC’s ecosystems in the protected area system. The biogeoclimatic zones in the area are coastal western hemlock, mountain hemlock and alpine tundra. The conservancy’s wide variety of wildlife enjoy excellent coastal habitat. It offers two major river estuaries which provide lush vegetation and a variety of fresh salmon during the spawning season. The conservancy provides habitat for mountain goats, grizzly and black bears, wolves, cougars, Columbia black tailed deer and small mammals, as well as the marine mammals, waterfowl and shorebirds typical of coastal inlets.